Naan is a traditional bread from Indian subcontinent, it is made in clay oven in India and Pakistan. This bread is must have on all occasions like weddings ceremonies, Religious ceremonies, parties, gatherings or any other ceremonies or parties. In United Kingdom naans are even used in any kebab shops, kebabs in naans are very famous in UK. 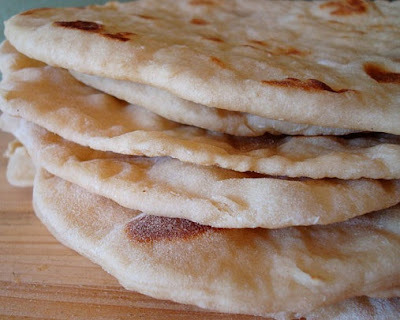 If you cook naans on maximum heat or under a preheated grill, the results are really good. Naans come in so many different varieties like stuffed naans, garlic naans, roghny naans and many more. Today we are going to share a simple recipe, Plain naan you can eat with curry or you can add salad and Peshawari kebabs or shaami kebabs infect you can have salad and spicy chicken bites. To make delicious naan kebab spread some baguette spread on the naan and add salad and kebabs or chicken bites and believe me you will want more that is how yummy it is. Add flour and salt in a fairly large bowl. Mix milk, yogurt, water, sugar and yeast in a jug, unless using Instant, active yeast, wait until it froths. Add oil and the beaten egg and mix it all together to form a ball of dough. Place the dough on to a clean surface and knead it for about 10 to 12 minutes, until it is smooth. Pour about 1/4 tsp oil into a large bowl and roll the ball of dough in it. Cover it with a piece of cling film and set aside in a warm, draught-free place for an hour or until the dough has doubled in size. Pre-heat the oven to the highest temperature. Put the heaviest baking tray to heat in the oven. Punch down the dough and knead it again and divide into 10 equal balls. Dust will a little flour if needed and roll out into a tear-shaped naan, about 15 cm in length and about 12 cm at its widest. Brush the top with melted butter and sprinkle some sesame seeds on it. Remove the hot baking tray from the oven, grease it well with butter and place the naan on to it. Put it into the oven on the top rack for 2-3 minutes. It should puff up and brown slightly (do keep an eye on it after 2 mins). Once puffed up from one side, flip the naan and back into the oven again for another 1-2 minutes till it starts to get puffed from both sides and slightly brown.